Figure 1. 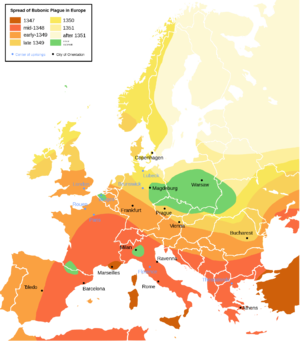 Spread of the Black Death in Europe. The Black Death or Bubonic Plague was a wide pandemic event that occurred from 1346–1353 in the Old World, affecting primarily Asia and Europe. It is estimated to have killed more than 30% of Europe's population, while also having a devastating impact on Asian cultures. It is one of the most devastating pandemics in human history and fundamentally changed the course of human events due to the high death rates in many countries and regions. It also remained in societies, reoccurring frequently between the 14-20th centuries in different regions, as the plague never completely faded away. The effects of the Black Death are still felt today, as places had to evolve to much lower populations. Prior to the Black Death, Europe had been facing a social and economic recovery. The population was growing rapidly, having gone from 38 to 74 million people in about 300 years. Learning and economies were beginning to thrive, with the diminished threat of Viking and other raids making commerce active across the continent. In Asia, the Mongols had invaded but trade was beginning to thrive under the Pax-Mongolica. This revived caravan routes and economies from China to the Near East, where the khanates, or Mongol successor states, thrived. In effect, the Old World was becoming more integrated as it had recovered and began to thrive to the changes initiated by the Mongol invasions. Connections again spanned the whole Old World and the Silk Road achieve a peak level of trade activity. Populations were increasing in many parts of the Old World. Figure 2. People began to question religious authority more openly after the Black Death. The Black Death had substantially different impacts on populations and exacerbated social change in many regions. In Western Europe, where populations were generally higher prior to the Black Death, the reduction of population made the remaining peasants and workers better able to negotiate higher wages (Figure 1). Revolts and rebellions occurred after the plague, but it ultimately helped lead to major social changes. It also led to the death of some of the nobility. Law changes to inheritance, allowing women in particular to inherit, led to gradual gender changes and increasing power for women in Europe in particular. Serfs also increased their power as their wages went up. In the long-term, the plague helped stamp out serfdom in Western Europe. In the immediate sense, serfs and nobility often fought in the years after the Black Death, but the lack of productivity in farms did help give more powers to peasants in Western Europe. 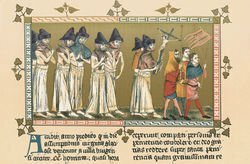 In effect, the Black Death helped to liberate societies and helped to set the stage for the Renaissance revival that occurred in Europe in the century after the Black Death. In Eastern Europe, it had the opposite effect of strengthening serfdom. In this case, population densities were much lower, thus revolts that followed the Black Death were less common. Upper classes simply reinforced their power through laws that tied workers to land and limited their wages and power. Revolts by the peasants only became a major problem in the 16th through the 19th centuries, serfdom lingered longer in Eastern Europe and did not disappear until the 19th Century. While two different types of European economic and political systems began to emerge after the Black Death, the outcome in the Middle East was very different. First, the cities that were very populated, such as Cairo and Mosul, lost huge number of people, leading to a de-urbanization in the Near East that took a long time to recover from. In Egypt, large areas along the Nile became abandoned, contributing to economic decline there that lasted probably until the 19th century. In effect, the Middle East became far weaker politically and economically after the Black Death. In fact, it was not until the 20th century that some cities and regions in the Middle East reached their Medieval population levels. In east Asia, rebellions eventually broke out against the Mogul ruling dynasty in China (Yüan dynasty). This was aggravated by the plague, where ultimately China regained its independence. The weakening of the Monguls was one of the great results of the Black Death. In India, the Delhi Sultanate collapsed soon after the plague, suggesting the uproar from the plague may have catalyzed this collapse. In Russia, the Golden Horde of the Mongols diminished in power, although it did rise briefly again in the late 1300s. In effect, it also allowed a long-term weakening that eventually allowed Russian-based dynasties to arise that eventually led to the succession of the Romanov dynasty to rule Russia. The Black Death also fundamentally changed to society. In an outgrowth of the bubonic plague, people began openly challenging religious authorities. Some Europeans began questioning the Catholic Church. It is not an accident that the Reformation began after the outbreak of these plagues in the 16th century (Figure 2). Other key social changes included an increased understanding of quarantine and its importance in medicine. This now began to be a common practice after the rise of the Black Death plague. Genetic diversity may have also diminished in parts of Asia and Europe, where it could have helped surviving populations develop better immunity (through genetic adaptation). Politically, the collapse of the great Mongol Empire and its states is the most obvious result of the plague. Other states, such as the Byzantine Empire, were weakened by plague and ultimately played a role in their collapse. Thus, one possibility is that the Mongol states could have continued to rule longer, perhaps allowing them to retain power in many regions. Politically, this could have shaped Russia and China, in particular, differently, where Mongol rulers could have ruled longer and potentially have had a more significant impact in the political and social order in those societies. In the Middle East, the presence of the Mongol states and Byzantine Empire could have resulted in making it harder for Turkic groups to migrate and establish power in the region. The Ottoman Empire was one of the beneficiaries of the Black Death because it significantly weakened the Middle East. Ottoman's influence may be dramatically lessened in the absence of the Black Death. This could have also meant that wide areas of Anatolia may have remained Christian for much longer and perhaps would have lingered to centuries to the present. In Africa, the major kingdom of Mali was not affected directly by the Black Death, but trade to it dried up as the Silk Road and other trade routes withered as trade declined. This led to its ultimate collapse. With the decline of the Mali kingdom, it led to political fragmentation in West Africa, possibly weakening that part of the continent for centuries due to political turmoil. Thus, we may have seen a larger and more politically united parts of Africa if the Black Death did not occur, potentially making it harder for Europeans centuries later to exploit the continent for the slave trade. In Europe, serfdom may have continued in Western Europe for longer periods, limiting or delaying the eventual development of political revolutions that occurred centuries later. The Renaissance may have begun later than it otherwise may have if the Black Death did not occur. The gradual increase of individual rights in Western Europe pushed states towards democratic processes. In effect, the democratization of Western Europe could have been stalled if the Black Death had not occur. While in Eastern Europe, including Russia, serfdom became well entrenched and lasted until the 19th century. It is possible population growth could have led to more rapid changes to the serfdom institution, leading to its earlier downfall than it otherwise may have been. Eastern European states, where individual liberties evolved more slowly, could have developed differently if the Black Death did not weaken the peasant population by so much. The Black Death affected many societies of the Old World in the 14th century, where it reoccurred in subsequent centuries as the disease never entirely went away. However, its effect was different in various regions, leading to some societies to benefit by gaining political and social freedom, while others collapse or populations became more controlled by ruling classes. The Black Death allowed the world to develop differently and ultimately change the course of history. Western Europe and the Ottomans gained increasing power as a result of the Black Death, which may have never happened otherwise. In Western Europe, individual liberties and its development may have been one byproduct as well. ↑ For more on the pre-Black Death World, see: Campbell, Bruce M. S., ed. n.d. Before the Black Death: Studies in the Crisis of the Early Fourteenth Century. Reprinted in paperback. ↑ For more on Western Europe after the Black Death, see: Herlihy, David, and Samuel Kline Cohn. 1997. The Black Death and the Transformation of the West. Cambridge, Mass: Harvard University Press. ↑ For more on changes in Asia due to the Black Death, see: McCracken, Kevin, and David R. Phillips. 2012. Global Health: An Introduction to Current and Future Trends. Abingdon, Oxon ; New York: Routledge, pg. 61. ↑ For more on the rulers of India and Russia after the Black Death, see: Benedictow, Ole Jørgen. 2006. The Black Death: 1346 - 1353 ; the Complete History. Repr. in paperback. Woodbridge: Boydell Press, pg. 51. ↑ For more on population changes after the Black Death, see: Meneely, Philip. 2017. Genetics: Genes, Genomes, and Evolution. New York, NY: Oxford University Press., pg. 172. ↑ For more on the weakening of the Byzantines and rise of the Ottomans, see: Ayalon, Yaron. 2014. Natural Disasters in the Ottoman Empire: Plague, Famine, and Other Misfortunes. New York, NY: Cambridge University Press, pg. 48. ↑ For more on the kingdom of Mali and the Black Death, see: Ramen, Fred. 2002. Sleeping Sickness and Other Parasitic Tropical Diseases. 1st ed. Epidemics. New York: Rosen. ↑ For serfdom in Russia, see: Dennison, T. K. 2014. The Institutional Framework of Russian Serfdom. Cambridge University Press. Cambridge.